Includes Choice of Mounting Bracket - Commercial Grade Unit - FREE SHIPPING! 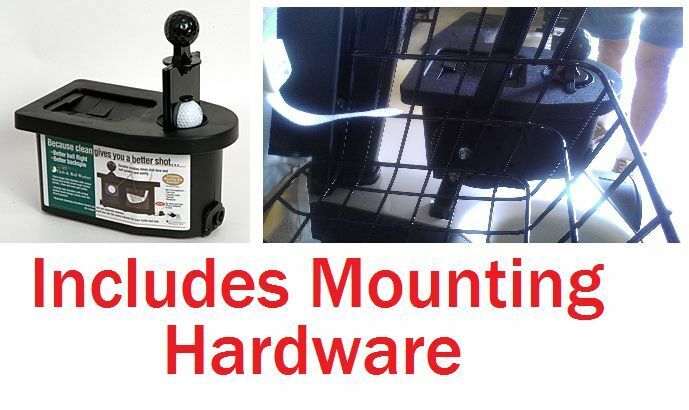 If you are searching for a true, commercial grade golf club and ball washer for your golf cart, this is it. Constructed of high impact, UV resistant plastic, this cleaner won’t crack or fade. Dual chambers allow for separate cleaning solutions. Tethered push-in plugs allow for easy draining and prevent plug loss while the rubber dampers at the top reduce brush splatter. Heavy-duty bristles quickly clean your golf club and golf ball so you get your best shot every time. It includes your choice of mounting brackets, and the post mount options do not require holes to be drilled in your cart. If you are searching for a true, commercial grade golf club and ball washer for your golf cart, this is it. Constructed of high impact, UV resistant plastic, this cleaner won’t crack or fade. Dual chambers allow for separate cleaning solutions. Tethered push-in plugs allow for easy draining and prevent plug loss while the rubber dampers at the top reduce brush splatter. Heavy-duty bristles quickly clean your golf club and golf ball so you get your best shot every time. It includes your choice of mounting brackets, and the post mount options do not require holes to be drilled in your cart.